EXECUTIVE SUMMARY The city of Columbia, South Carolina, received assistance from EPA’s Greening America’s Communities program to visualize potential improvements to a city-owned parcel of land along the Rocky Branch, which runs east-west from the Five Points district in downtown to the Congaree River. This project fits into the larger vision for Columbia’s Rocky Branch Greenway and is one of the last remaining stands of canopy trees and space for recreational use in the Capital City Mill District. EPA contracted landscape architects and designers from McLeod Landscape Architects and MKSK Studios to guide the city in the development of concepts based on the goals of the city and the desires of the public. The design and consultation process included a three-day workshop in Columbia with federal, state, county, and city staff; local property owners; residents; local developers and designers; and other stakeholders. This report illustrates the existing site conditions and potential design strategies for five selected areas within. Each of these areas has its own set of challenges such as polluted stormwater runoff, excessive flooding, and demolition debris accumulation. Workshop participants expressed the desire to improve access to the site so people could enjoy a quiet, natural area within the city; reduce flooding concerns; and link the site to a wider greenway network planned in the city. Design options include green infrastructure such as new street trees and bioswales that can reduce runoff volume and filter it as it percolates into the ground water. Ideas for the restoration of the eroded banks of Rocky Branch and the installation of public gathering areas for relaxation and learning are also depicted. The city of Columbia, working with its partners and stakeholders, could use the designs and implementation options to guide a revitalization of the Rocky Branch parcel to create an attractive setting for recreational activities, commuting, and learning. INTRODUCTION As demand in the city center grows and the University of South Carolina expands, development pressure is building on surrounding neighborhoods, including the Capital City Mill District, located just over 1 mile south of the South Carolina State House. The historic textile mills that once served as the heart of the neighborhood are being reborn as housing and commercial development, offering restaurants and other amenities previously absent from the area. However, despite the new development, the area still has few transportation options, traffic congestion, and many vacant and blighted properties. Flooding of the Rocky Branch is a particularly acute issue in need of attention, as it runs through the heart of the area. The Rocky Branch is part of the Congaree Watershed, and its lower stretch runs through the Capital City Mill District. Its current state, defined by eroded banks, debris, pollution, and environmental degradation, negatively impacts adjacent land value and the public’s perception of this natural resource. However, residents believe a revitalized Rocky Branch could serve as a catalyst for the area, providing environmental, public health, and community benefits. Recognizing the potential of the Rocky Branch, the city of Columbia, South Carolina, applied for technical assistance through the EPA’s Greening America’s Communities program in 2016. The city requested assistance in developing a community vision for a greenway along the Rocky Branch, specifically looking at an 8.5-acre, city-owned parcel between Bluff Road and the former Capital City Stadium. The city’s goals include: addressing flooding, improving water quality in the Congaree River, improving bicycle and pedestrian connections, connecting to a larger planned greenway network, and creating a neighborhood amenity that helps spur additional neighborhood revitalization. The vision for the Rocky Branch greenway will complement a host of related projects, increasing its potential for success. These projects include: an area planning study for the Capital City Mill District, conducted by the city of Columbia and Richland County; redevelopment of the former Capital City Stadium; the Rocky Branch Watershed Assessment, recently completed by the city;1 and the Richland County penny sales tax for transportation, including an earmark for the Rocky Branch Greenway. EPA put together a team of federal agency staff and hired landscape architects from McLeod Landscape Architects and MKSK Studios to help the city develop concepts synthesizing the work done to date, the goals of the city, and the desires of the public. The work on the following pages illustrates this collective vision. 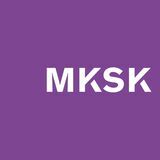 1 McCormick Taylor and KCI Technologies. Rocky Branch Watershed Assessment. City of Columbia. 2016. https://www.columbiasc.net/depts/utilities-engineering/docs/sw/watershedplans/ws-plan-rocky-branch-2016-may20.pdf. WORKSHOP DESCRIPTION The city of Columbia hosted a three-day design workshop from July 11 to 13, 2017 near the Rocky Branch site. Attendees included representatives from federal, state, county, and city staff; local property owners; residents; local developers and designers; and other stakeholders. The project team presented on-site findings, analysis, and preliminary design work done prior to the workshop for five separate areas determined to have the most impact on the potential development of the Rocky Branch parcel. Each of the five areas was the subject of a one-hour focus group. Attendees openly shared their thoughts and concerns regarding site improvements for the individual areas and how they relate to one another. Participants discussed the history of accumulated demolition debris on the site and resulting environmental and watershed impacts. They shared ideas for potential site improvements that could make the area a natural amenity given the limitations on development due to being located in a flood zone. Attendees also discussed the need for better pedestrian, bicycle, and vehicle access to the site from the surrounding community. Focus groups explored possible implementation strategies and sources of funding. The community members expressed the importance of the subject parcel being a key component in the Rocky Branch Greenway. They would like to see the site become an entry point to the trail system as well as a destination for pedestrians and cyclists from other areas in the city. Public safety and security are of particular importance for the site and connecting trails. Recognizing this site as one of the few wooded parcels remaining along the Greenway, focus group attendees were passionate about the utmost care being taken to preserve the natural beauty of the site. With comments and input from the participants in-hand, the design team then moved into a work session to incorporate the information and returned the next day with a revised, more detailed concept that reflected community priorities and goals. On the final day of the workshop, a public open house was held allowing all interested parties to view the resulting design options. EXISTING CONDITIONS CONTEXT Nestled in the heart of the Capital City Mill District, the Rocky Branch site is within walking distance to downtown Columbia, the University of South Carolina campus, and the Congaree River corridor. The city’s proposed Rocky Branch Greenway would enhance pedestrian and bicycle connectivity to the site from the Congaree River to north of the University of South Carolina’s campus, while Assembly Street serves as the site’s primary vehicular connection to downtown and beyond. Parks and open space are sparse in the surrounding area, particularly to the south where large industrial tracts of land dominate the landscape. Olympia Park lies just to the west of the site but is separated by a raised and abandoned railroad berm. The site is the largest open space with significant tree canopy within the Rocky Branch sub-watershed. Currently it is hard to see into or travel through the site because of dense vegetation. It is also hard to get to the site because no sidewalks or other paths provide direct access from adjacent streets. Access to the site by transit is limited to only two bus stops located along Assembly Street north of its intersection with Dreyfus Road. An elevated railroad berm to the west of the site makes direct pedestrian connections to Olympia Park challenging. Plans to better connect the site with its surroundings include the Rocky Branch Greenway and a series of streetscape improvements to Assembly, Lincoln, and Heyward streets. These projects will receive funding through a Penny Tax levy passed by Richland County. CURRENT LAND USE The Rocky Branch site is publicly owned and currently sits vacant. Large swaths of vacant land occupy the western and northern edges of the site, while residential uses are to the south. The former Capital City Stadium anchors the eastern edge of the site on city-owned property, though it is currently out of operation. UTILITIES AND INFRASTRUCTURE The Rocky Branch site contains a complex network of infrastructure. Overhead power lines crisscross the site, traversing its eastern and western edges while an overhead line and easement runs through the southern half from east to west. A sanitary sewer line and easement bisects the site (east to west) while another follows along the site’s northwestern boundary. The city plans to realign the northwestern sanitary sewer line so that it more closely follows the course of the Rocky Branch as it passes through the site. Stream culverts are located at the edges of the site where the Rocky Branch flows under Bluff Road and Dreyfus Road. Stormwater outlets dot the edges of the site and Rocky Branch, though some have been abandoned while others continue to carry water from adjacent properties. An abandoned building and storm drain system sit at the southeastern edge of the site. LANDSCAPE FEATURES Vegetated cover within the Rocky Branch site is dense and largely consists of kudzu, privet, and other invasive species, though several trees of significant size and stature dot the site. Clearings within the canopy tend to occur along utility lines and in areas where there has been recent infrastructure work. The Rocky Branch channel itself is heavily incised and channelized, with construction debris and other trash lining its edges. Wetlands surround the Rocky Branch with the largest being at the low point in the southeastern corner of the site. FLOOD RISK The Rocky Branch bisects the site flowing east to west toward the Congaree River. Prone to flooding, the entire site lies within a FEMA flood hazard area, though FEMA is currently updating flood designations for the area. The high point of the site is at the southwest corner (elevation 16 feet) with approximately 17 feet of change to the low point at the Bluff Road culvert. Multiple storm sewers introduce off-site water from adjacent streets and commercial and industrial land to the Rocky Branch on this site. These sewers funnel water from the surrounding area into a smaller, confined space, increasing the rate of flow to and through the site, intensifying flooding, and degrading the structural and biological health of the Rocky Branch. SCHEMATIC SITE PLAN The vision for the new park is a quiet respite that preserves, enhances, and highlights the site’s natural features while responding to residents’ desire for public access and places for gathering, recreation, and education. A network of paths and trails allows visitors to access and explore the site. To the north of the Rocky Branch, a paved multi-use trail follows the path of a proposed sanitary sewer re-alignment to enable concurrent construction that would minimize disturbance and costs. A system of secondary paths links visitors to gathering spaces that showcase the natural features of the site, while improving linkages to the surrounding neighborhood. The Appendix highlights two case studies of other communities that have similarly turned neglected sites into parkland. Participants in the workshop expressed a desire for better access to the park while still retaining its natural features and creating opportunities to educate visitors about its ecological value. In response, the Wetland Overlook design option improves access to the existing wetland and enhances how well it functions. By replacing invasive plants with native plant species such as yellow root and sedges, the existing wetland can better clean and filter water of pollutants and provide animal habitat. While mostly dry, the wetland will be periodically inundated during heavy rains. A new sidewalk along the east side of Bluff Road improves pedestrian safety and access to the greenway and park. A new overlook along Bluff Road creates space for viewing the wetland, educational signage, and environmental art. The boardwalk allows access to the wetland so visitors can explore and learn. The wetlands on site lack the diversity of plant species necessary for a healthy ecosystem. The lack of paths severely limits access into and through the site. The Wetland Overlook provides access to and enhancement of this natural system. Educational signage informs visitors of the ecological value of the wetlands and the benefits of their preservation. The section illustrates the proposed condition just north of the intersection of Bluff Road and Florida Street. The addition of a sidewalk along the east side of Bluff Road improves pedestrian safety and access to the greenway and park, while a new overlook creates space for viewing the wetland, educational signage, and environmental art. A boardwalk provides access to the wetland. The Stream Crossing design option features a bridge as an architectural focal point along the greenway and addresses workshop participants’ desire for improved access through the site. The crossing provides a place for fishing and play in the water after water quality improves. The design of the bridge is to be compatible with the larger park and greenway system and appropriate to the naturalized setting. It would be ADA accessible and feature interpretive signage. The crossing and secondary paths could be phased in as funding becomes available. The Rocky Branch channel is heavily incised and channelized, with construction debris and other trash lining its edges. No opportunities to access or cross the Rocky Branch currently exist. The Stream Crossing proposes an architectural focal point along the Rocky Branch Greenway that improves access within the site and enables exploration of adjacent preserved wooded areas. A variety of restoration techniques could improve the site’s ecological and recreational value. In-channel improvements could stabilize the banks of the Rocky Branch, create aquatic habitat, and relieve localized flow impediments. Improvements include “benching” the channel, or widening the channel with stepped benches to increase the channel’s capacity, which slows down the water and reduces erosion. Increasing the capacity of the channel also reduces flooding hazards, which are a major concern for residents of the area. The benches can be planted to further help stabilize the banks and create terrestrial habitat. Other improvements include preserving mature trees and existing native vegetation while removing underbrush and invasive plant species. Degraded riparian zone vegetation and high flow rates are severely eroding the stream banks, putting more sediment into the water and degrading both water quality and habitat. Widening the stream channel will improve public access to the water’s edge and reduce the flooding issues, which are a constant concern of the community. Workshop participants said they would like a place for people to spend time in the park. 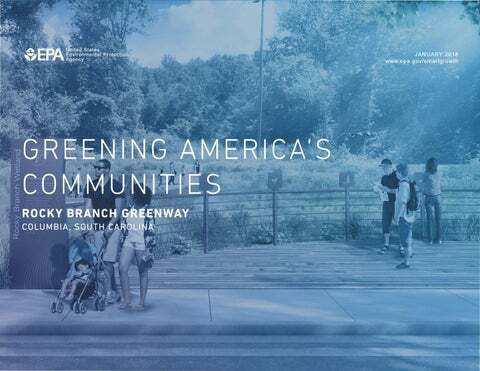 To address this need, the Gathering Area design option provides space for small community gatherings, natural play, environmental education, and a comfortable resting point for those traveling along the Greenway or simply taking a stroll through the site. The creative re-use of site-salvaged debris defines the character of this space, with large concrete slabs doubling as retaining walls and seating areas, while natural elements create areas for play. Currently the site is overgrown with invasive plant species and lacks tree cover. The once overgrown site is changed into a comfortable, shaded gathering space where old debris is turned into attractive and fun elements. AREA 05 NEIGHBORHOOD CONNECTION The intersection of Assembly Street and Dreyfus Road is the primary access point to the site. Workshop participants thought that this intersection could be improved to better connect the site with the surrounding neighborhood. The Neighborhood Connection design option realigns Dreyfus Road at Assembly Street to a three-way “T” intersection that would improve pedestrian and cyclist safety by reducing pedestrian crossing distances and slowing down turning cars. A 14-foot wide shared-use path is located along Assembly Street and aligns with planned bicycle and pedestrian improvements of the Richland Penny Program along Assembly Street. This path connects to a 14-foot wide shared-use trail (adhering to the City of Columbia Greenway Standards) along Dreyfus Road that provides access to the site. The development of the trail along Dreyfus Road will require coordination with the future private redevelopment of the Capital City Stadium site. Planted areas along Assembly Street and Dreyfus Road capture and treat runoff while beautifying the streetscape. Public art at the intersection and along the greenway enhances the identity of the area. The intersection of Dreyfus Road and Assembly Street completely lacks pedestrian or cycle facilities. Due to the angle at which Dreyfus Road intersects Assembly Street, crossing distances at this corner are abnormally long making traversing this intersection not only uncomfortable but also dangerous for a pedestrian or cyclist. The Neighborhood Connection greatly improves pedestrian and bicycle access to the park. New planted areas collect and treat stormwater runoff while beautifying the streetscape. New trees provide much-needed shade. The section illustrates the proposed condition just west of the intersection of the Rocky Branch and Dreyfus Road. This point serves as a gateway to the park and includes wayfinding signage to inform visitors of the site’s offerings, situate them within the larger greenway system, and enhance the identity of the area. Planted areas along Dreyfus Road treat runoff while beautifying the streetscape and providing shade through the planting of street trees where space allows. In narrower sections, shorter vegetation could be planted to function as a bioswale that absorbs stormwater while providing a visually appealing buffer between pedestrians and the street. A 14-foot wide shared-use trail continues from the property along the southern side of Dreyfus Road to Assembly Street and beyond, while an 8-foot sidewalk lines the northern side of Dreyfus. project to be implemented in phases as resources allow. vegetation for bank stabilization and habitat. Mill District achieve its goals. Columbia would coordinate on this project. NEAR TERM STEPS (ONE TO THREE YEARS) Create a maintenance plan that includes removal of invasive species (including but not limited to kudzu, privet, and English ivy) and clearing of overly dense understory plantings across the entirety of the site as part of a long-term plan that would restore and maintain the site’s ecological function. The city or county government in conjunction with an organization such as the Rocky Branch Watershed Alliance could undertake this task. Diversify and preserve native vegetation across the site. This would follow the removal of invasives and overly dense understory plantings. The maintenance plan mentioned above could address the care and cultivation of native plant species. The city or county government in conjunction with an organization such as Sustainable Midlands could undertake this task. improving pedestrian safety and access to the site. Greenway” project. Richland County and the city of Columbia would coordinate on this project. IMPLEMENTATION STRATEGIES larger park and greenway system and appropriate to the naturalized setting. Realign Dreyfus Road at Assembly Street from a “Y” style intersection to a “T,” improving pedestrian and cyclist safety by reducing crossing distances and vehicular speed. This realignment would include the addition of pedestrian safety features (crosswalk, bollards, signage, detection strips) and new vehicular stop signs and traffic control measures. Several governmental entities (the city of Columbia and Richland County) would need to collaborate, building on transportation improvement projects proposed as part of the Richland County Penny Tax. Incorporate green infrastructure along Dreyfus Road and Assembly Street, including but not limited to, stormwater infiltration basins and the addition of street trees. LONG-TERM STEPS (FIVE TO TEN YEARS) Explore strategies and partnerships for the redevelopment of vacant parcels and repair of existing structures surrounding the Rocky Branch site. Explore strategies for the deployment of green infrastructure best management practices at a districtwide scale to reduce the volume and improve the quality of the stormwater entering the Rocky Branch. FUNDING SOURCES The City of Columbia’s Stormwater Bond could offer financial support. http://www.columbiasc.net/stormwater The philanthropic community in the region could be leveraged for support. The city could also explore the formation of public-private partnerships to fund the project, especially in connection with redevelopment of the city-owned Capital City Stadium site. The local community could be engaged in regular cleanup efforts. APPENDIX SCIOTO AUDUBON METRO PARK LOCATION Columbus, Ohio DESIGNER MKSK Studios OVERVIEW “The vision for this unique urban park space included wetland habitat restoration and establishing a living laboratory within an integrated educational environment.” MKSK Scioto Audubon Metro Park provides an important case study for strategies to develop the Rocky Branch site into a passive, ecologically rich public space. Located just outside of the heart of downtown, this 75-acre reclaimed brownfield site is home to a diverse range of riverine environments, from restored natural wetlands to prairie areas. Visitors to the site can experience and engage with these dynamic natural systems along an extensive network of walking trails, wetland boardwalks, and bike paths. This circulation system is integrated into large regional and local pedestrian and bike networks ensuring easy access to the host of offerings and amenities the surrounding communities have to offer. A comprehensive wayfinding and signage strategy highlights to visitors the hidden natural systems at play and ensures easy navigation to, from, and within the site. RENAISSANCE PARK LOCATION Chattanooga, Tennessee DESIGNER Hargreaves Associates OVERVIEW “Renaissance Park provides a canvas for social engagement, healthy lifestyles, and environmental education, leveraging ecosystem services of preserved floodplain forest, meadow plantings and a constructed wetland that treats site stormwater and increases floodplain storage capacity.” Hargreaves Associates A piece of the larger Tennessee River Park and the final phase of Chattanooga’s 21st Century Waterfront Master Plan, Renaissance park illustrates the integration of natural ecosystems and public recreational space within an urban environment. Located just across the river from downtown, the project transformed a contaminated post­ industrial site into a vibrant park, blending floodplain, forest, native meadow, and constructed wetlands with communal spaces of various scales. The use of preservation areas and native plantings reduced the park’s construction and maintenance costs while allowing visitors the opportunity to engage with nature and place unlike any other part of the Chattanooga riverfront. The project’s attention to preservation and adaptive management strategies, along with the thoughtful combination of green infrastructure and public space make this a prime example of what could be accomplished on the Rocky Branch site.